Below is a list of my new found knowledge of the city obtained from my exclusive Inside Detroit tour. I hope this inspires and motivates you to explore all the great wonders of Detroit the same way it inspired and motivated me. 2. Detroit is the only city to win three major sports championships in one year. The Red Wings, Lions and Tigers all won in the 1935-36 season. 3. There are over 125 bars and restaurants within the one square mile of Downtown Detroit, including the first Coney Island restaurant. 4. Despite its name, the Detroit River is actually a strait. Confusingly enough, the name comes from the French “Rivière du Détroit”, which translates to “River of the Strait”. 5. The Renaissance Center, located on Detroit’s RiverWalk, is so large it has its own zip code. 6. Detroit has the second largest theater district in the country with over 13,000 theater seats in a two block radius. 7. 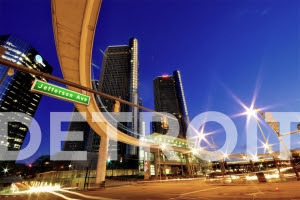 Downtown Detroit has 37 percent less crime than the national average. 8. Martin Luther King Jr. gave part of his “I Have a Dream” speech for the very first time in Detroit when he marched on Woodward Ave.
9. Many of Motown’s greatest hits, including my favorite, “My Girl” by The Temptations, were recorded in the basement of a house on W. Grand Boulevard. This home was bought by Berry Gordy Jr. and named “Hitsville U.S.A”, which now operates as Motown’s Historical Muesum. 10. The City of Detroit has nearly 40 square miles of vacant land. Interested in learning more about the city, but don’t know where to start? Check out Detroit Moxies’ “40 Things to Do in Detroit Before You’re Dead.” As for me, I think my next stop is Harmonie Park to spot Richard Gere as he films his newest movie.